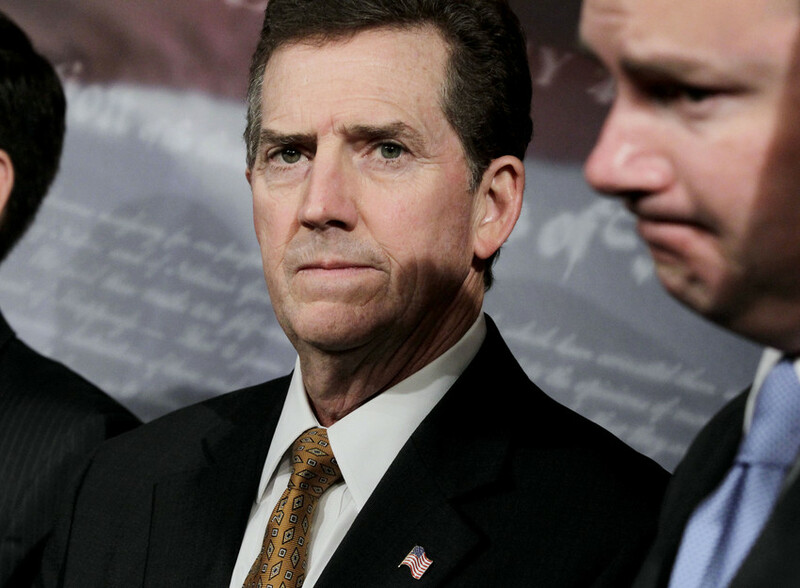 Jim DeMint will leave the U.S. Senate to head the conservative Heritage Foundation. The Senate’s scorched-earth Tea Party godfather — Jim DeMint of South Carolina — has stepped down to head the conservative think tank The Heritage Foundation. DeMint is the always concerned-looking, handsome Club for Growth elder statesman who stood by Todd Akin when every Republican walked away, channeled funds to Akin and said, “We support Todd Akin and hope freedom-loving Americans in Missouri and around the country will join us so we can save our country from fiscal collapse.” Never mind that the problem with Akin wasn’t his fiscal policy or that he was anti-abortion, but that he was idiotic about the female reproductive system. The same Jim DeMint favored barring gay teachers from schools because “if someone is openly homosexual, they shouldn&apos;t be teaching in the classroom” — just like an unmarried woman who&apos;s sleeping with her boyfriend — “shouldn’t be in the classroom” either,” he said. And the same Jim DeMint tried to tack an anti-choice amendment on to a farm bill that would ban discussing abortion between a woman and her doctor over the internet and through video conferencing — even if the woman’s life is at risk. That guy, that Jim DeMint! The one who backed, not just Akin, but Sharron Angle and Christine O’Donnell, without hesitation or shame. The man who managed to pass not a single piece of substantive legislation in his eight years in the Senate is now headed off to head a policy institute. The man whose greatest achievement in the U.S. Senate was to be in perpetual opposition, whether to the Democrats or his own party, and who helped land the GOP exactly where it is now in the fiscal negotiations, is now going to step out of the fray and throw bombs from the sidelines. There’s no question that, especially post-election, DeMint will have greater influence outside the Senate — where Dems just increased their number as DeMint’s candidates got trounced — than in it. Moreover, if he stayed, he risked becoming ostracized by traditional Republican leadership, which is scrambling to find anything that looks like a compromise to demonstrate some bipartisanship, anathema to DeMint. What happens next? South Carolina Gov. Nikki Haley will name a place holder, quite likely U.S. Rep. Tim Scott, making him the one and only African-American in the Senate. Then South Carolina voters will have the pleasure of electing a governor and two new U.S. senators in 2014. The luckiest guy in all of this? Lindsey Graham, the state’s other Senator, will now be involved in one of many hot races and can safely assume that whatever crazy right wing money was going to be used against him in a primary challenge will be split at least in two.